Engineered from the ground up, this new lineup of track loaders delivers more power. And that's just the start. 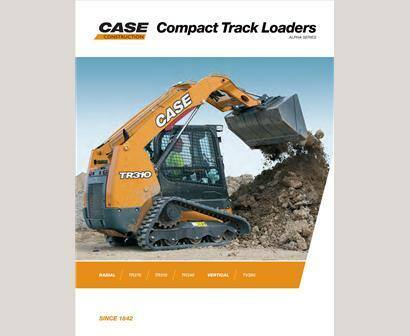 CASE compact track loaders are designed to dominate. Whether you’re up against tough digging, loading, pushing, or grading, these mini track loaders can help you conquer just about any job. After all, you deserve a machine that works as hard as you do. Need to run your loader longer, stronger, and more profitably? No problem with CASE’s heavy-duty rotational force—get up to 282 lb.·ft. (383 N·m) at 1,400 RPM—more power than ever before. With more than more than 8,700 lbs (38.7 kN) of breakout force, CASE compact track loaders provide you with more strength to lift and move, so you can do more each day. CASE compact track loaders offer three different optional auxiliary hydraulic packages: standard, high-flow and enhanced high-flow. They also offer secondary auxiliary hydraulics for applications requiring multiple hydraulic movements simultaneously. Our dozer-style undercarriage is engineered to hold fast on steep slopes and take command of muddy or sandy terrain. Rigid track frame with fewer moving parts. More durable and easier to maintain than suspension track systems. New roller and idler technology reduces maintenance costs and increases undercarriage life. Narrow chassis width makes it easy to load and unload on trailers. Climb in the cab and you’ll feel the difference. We know your cab is your workplace, so we designed an operating environment that delivers more room, visibility, comfort and control. Easily see what’s all around you with industry leading visibility and standard side lighting, ensuring operators can maneuver quicker and more confidently at any time – that’s safe operation. A comfortable operator is a productive and happy operator. At nearly three feet wide, CASE compact track loaders offer one of the largest ROPS/FOPS-certified cabs in the industry. It’s fully sealed and pressurized to reduce noise, dust and fumes—and comes with an optional radio and upgraded climate control system. EZ-EH controls: Quickly switch between personalized settings for speed and control customization; program up to nine different presets to recall operator settings for different jobs and different operators - all at the touch of a button. There’s also an intuitive lockout menu and rocker switch to easily alternate between CASE “H” and “ISO” patterns. Ride Control™: Just push a button to automatically steady the loader arm when traveling at elevated speeds and the machine automatically compensates with greater shock absorption and reduced loader arm bounce, so you can work faster than ever without spilling your load. Large 16- to 25.5-gallon fuel tanks can run all day without refueling because of new CEGR technology which helps boost productivity and fuel efficiency while meeting new Tier 4 emissions regulations. Every CASE compact track loaders loader features a proven Tier 4 Final solution that is tailored for that model. CASE Tier 4-certified equipment is easier to maintain and, unlike competitive models, won't require you to master additional maintenance procedures. In fact, most CASE machines have maintenance-free emission solutions, so you can stay focused on your work—and not maintaining your machine. Cooled Exhaust Gas Recirculation requires no operator maintenance or management. CEGR is included in all CASE compact track loader models. Diesel Oxidation Catalyst is a maintenance-free solution—no fluids to add and no filter to replace. Particulate Matter Catalyst is a maintenance-free solution—no fluids to add and no filter to replace. Selective Catalytic Reduction is a simple after-treatment solution that combines DEF (Diesel Exhaust Fluid) with exhaust to convert emissions into nitrogen and water. CASE loaders are compatible with more than 250 buckets, forks, brooms, augers, rakes, grapples, hydraulic hammers, snow accessories, bale spears and other CASE attachments. Plus, the hydraulic coupler option makes changing buckets and attachments easy, without ever getting out of the cab. Ask your technicians. Case has a reputation for easy-to maintain-and-service equipment. The new Case compact track loaders are no exception. The new design dominates the industry’s top SAE serviceability rankings with features such as easy ground-line access for daily maintenance checks. Need help? Our customer support team is on call with a Customer Assistance Hotline that operates from 8am to 11pm seven days a week (except Sundays, December through March).